If you are seeking an apparel silk screening partner that will make your brand scream, then look no further than Zapazoo Inkworks. Our equipment is the best in the industry and so is our carefully chosen Zapazoo creative and screen team. This is not a hobby. It’s our passion. Our studio is a fun and inviting experiential gallery that embraces and encourages creativity. We view what we do as a lost art form and we enjoy sharing our creative process with the neighborhood. We print it all. Branded and custom graphics. Athletic wear. Booster club, fundraising and special event apparel. Retail merchandise. Your creative design our ours. It’s your choice. Think of the endless possibiliTEEs and let us give your next apparel screening project some fresh ink. Our goods are created the old-fashioned way, hand made, one at a time. Our pricing competes with anyone. Hobbyists that work out of their garage and those dark-hole companies that ply for your opportunity on the Internet. Our Zapazoo design team consists of highly acclaimed graphic artists and you. We collaborate when we create. It’s a refreshing approach that we think you will come to enjoy. We carry the finest lines of tee shirts and other apparel. We have lines of credit and strong working relationships with all of the greatest apparel lines. Adidas. Alo. Alternative Apparel. American Apparel. Anvil/Anvil Organic. Bella — Canvas. Champion. Dickies. Dri-Duck. Flexfit. Fruit of the Loom. Gildan. Hanes. Independent Trading. IZOD. J. America. Jerzees. Next Level. Sierra Pacific. ZI gives a percentage of it’s profits to good causes. It’s the least we can do. And you can feel great about wearing a Zapazoo. Consider Zapazoo Inkworks for your next silk screening project. We’re almost famous. Already loved. And ready to make a splash. Get to know each other and make it happen. We’re in the studio. We’re screening. Creating. Transcending. Trending. You’re invited. Zapazoo Inkworks. Wear us out. “Zapazoo,” Don would always say as we were ready to head out. For as long as anyone can remember, that was how Don would bid farewell after hanging out together. An energetic “Zapazoo” and a quick brush of his right hand in an abbreviated waving motion. It stuck with us. It became an insider thing. We actually looked forward to it even though it meant we were leaving his presence. Everyone knew that you had become part of Don’s extended family when he sent you on your way with a “Zapazoo.” We liked the feeling it created. It was an Aloha thing. It was engaging. It was memorable. And it always left you with the promise of seeing each other again, hopefully soon. Pass it along and start your own Zapazoo. You’ll be glad you did. Bo was born in Aspen Colorado in 1989, and has called it his home ever since. He attended all of the Aspen School District schools in his childhood and adolescence and loved spending his years enjoying what this great valley has to offer. Bo graduated from Aspen High School in 2007. While in school Bo played hockey, golf, and soccer both recreationally and for the schools. He also enjoys skiing, tennis, flyfishing, biking and hiking in the beautiful paradise that he calls home. Bo attended the University of Colorado at Boulder preceding his graduation from Aspen High School. He graduated with a Bachelor’s Degree in Sociology with an emphasis in Communications. While there he enjoyed playing soccer and hockey and skiing whenever there was enough time to head for the hills and carve away. Since Bo left Aspen he knew it wouldn’t be long until he would be back enjoying what this great valley has to offer. After graduating from CU at Boulder, Bo moved back to Aspen and became engaged in the silk screening business. He became a master silk screener and became enamored with the industry. In 2012, Bo started Zapazoo Inkworks. He continues to grow at his trade to perfect his abilities as a screen printer and is energized by creating what has not been created before. The Roaring Fork Valley is Bo’s home. He loves it here. He loves the people. The active lifestyle. The mountains. The beauty. The valley charges his creativity. By being involved in this exciting new lifestyle apparel organization, Bo is able to capitalize on his creativity and design skills to create custom apparel that will put Zapazoo on the map. And on your body. Zapazoo is not a hobby for Bo, it is a career. A Colorado native, Jenna has been a resident of Aspen for the last 9 years and has lived in a ski town her entire adult life. She does not think she'd enjoy living in the "real world." Jenna loves the vibe, amazing vistas and passionate people of the Roaring Fork Valley. Some of her favorite pastimes include skiing and snowboarding, hiking, rafting, stand-up paddleboarding. drawing, painting, and photography. She is also an avid reader and traveler. Jenna has worked in the design, marketing and communications industry for over 15 years, during which time she has garnered acclaim and won awards for design and advertising. Jenna is the Lead Designer and a Partner at Forte International. Prior to that, Jenna worked in both the advertising and editorial sides at various media outlets, managing the rebranding efforts for several publications. Jenna graduated with honors from the School of Design at Platt and holds a degree in Graphic Design and Visual Communication. Jenna was the designer of the Zapazoo Inkworks branding platform. She loves life, style and creating wearable art. She is energized to provide unique apparel designs for Zapazoo that also make a fashion statement. She looks forward to connecting with people on a visual level as major part of the Zapazoo Inkworks in-house design team. 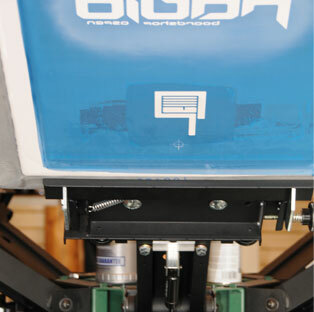 We have a portable screen printing machine so can be on-site at your next event. Your special occasion will be even more sweet with live, fun customization. tee shirts and other apparel. Our focus on detail is unsurpassed. Every single t-shirt and item is individually hand-done with the utmost care. © 2018 Forte Aspen and Zapazoo Inkworks. All rights reserved.